This month, work began on the first new tramway to be built in central Paris for more than 60 years. An eight-kilometre (five-mile) stretch is to be built in the 14th arrondissement, south of the River Seine, to link the Pont de Garigliano on the city's western edge with the Porte d'Ivry to the south-east. You might think that Parisians would be sighing happily with nostalgia for the days when pedestrians could hear the rattle of the rails and the clang of a tram bell, rather than the noise of horns. But the Tramway de Marechaux Sud project (TMS) has long been controversial, and the chopping down of some 75 trees along a green city avenue to make way for the tram-lines has re-ignited a heated debate which began in 2001. The plans are all part of the Paris Mayor Bernard Delanoe's promise to "green" transport in the French capital. He says the tramway with its 17 stops should take up to 28 million passengers a year when the service opens in 2006, and will cut down 25% of traffic in the area - all at a cost of a mere 260 million euros. The tram, travelling at 20km an hour, won't be quite as picturesque as its 1930s predecessors but a sleek, modern version with on-board information screens for passengers. But the chopping down of the trees on 15 July on the Boulevard Jourdan was described as a "massacre" by local environmentalists. The tramway should have been built on existing rail tracks, they argue, many of which have lain disused since Paris gave up most of its tramlines in the 1930s in favour of the motorcar, metro and buses. Only two other tram services are still running, both on shorter stretches. Earlier this month, the Association for the Defence of the Environment in the Montsouris Park (ADEPAM) called on local people in the 14th to join in a march against the "undesirable" tram. The irony is that the politician in charge of the project, and Paris transport networks generally, is a Green, Denis Baupin, who says that the temporary travails are worth it for the end result. Mr Baupin admits that authorising an axe to be taken to the trees was not a great moment for a Green, but that with 2,240 trees planned along the route, the initial sacrifice of some existing greenery was necessary. It was done in the early morning hours "to avoid disrupting the traffic". He's now sent out an open letter to local residents, asking them to be patient and describing the tram as a unique opportunity to reinvigorate, both economically and visually - an area that's become something of a car-ridden desert. He promises a better quality of life for all thanks to the new tramline. There are many supporters of this project, and even more ambitious plans to create a whole new "beltway" tramline all the way around Paris. Though the Paris metro is popular, and the buses run frequently, car travel in Paris is becoming increasingly difficult. 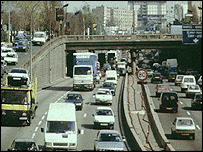 On working days the peripherique motorway around the city is jammed in both directions, and finding parking in the centre is a daily chore. The extensive tram network which used to run through the city is now seen as a possible solution, not for the centre where the streets are too narrow, but for the outlying suburbs, where noise and air pollution from the busy motorways is an increasing problem. Residents near the peripherique currently put up with noise levels of up to 100 decibels. On the whole, local people are guardedly supportive of the new tram line, but most say they'll reserve judgement on the promises of local politicians until the tram itself is up and running.